San Antonio Spurs fans can feel pretty good about the Rio Games. The newest Spur, Pau Gasol, put up 31 points and 11 rebounds while leading Spain to an 89-88 win over Australia in the bronze medal game. Tim Duncan’s replacement looked pretty good leading Spain to its third medal in the last three Olympics, taking silver in the previous two. 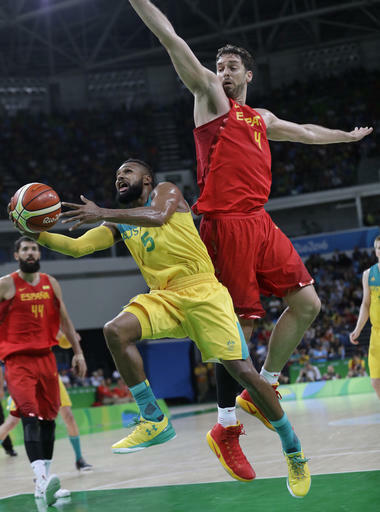 Spurs reserve Patty Mills nearly willed the Aussies to victory as Spain struggled to stay in front of the point guard. The sharp-shooter with the quick release finished with 30 points, two assists and three steals. Australia was running a final play for a possible game-winner from Mills, but Spain knocked the ball away from teammate David Anderson before Mills could come open off a screen. “Patty carried us the last two games,” Australia and Mavericks center Andrew Bogut said. “He was our go-to offensively. ... He was a spark for us all tournament. Throw in the Olympic moment for Spurs starting point guard Tony Parker, who retired from international competition after France was eliminated and Spurs’ fans had plenty to cheer about in Rio.